Sutton Foster’s 40th birthday concert at Carnegie Hall was the best present we could’ve had. I have frequently praised The New York Pops for their consistently strong musical arrangements and quality performances. 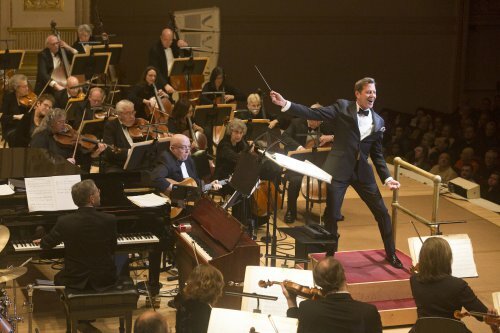 Thanks to Maestro Steven Reineke’s steady, baton-wielding hand, they always put on a good show. However, as evidenced by Friday, March 13th’s installment of their Carnegie Hall season, not all concerts are created equal. One Night Only: Sutton Foster, a concert starring the two-time Tony Award-winning actress and featuring a couple of her favorite costars, stood out as a particularly exceptional evening of song, raising The Pops’ already high bar for excellence. The concert’s triumph was due largely to its headliner, the incomparable Sutton Foster. Since her Tony Award-winning portrayal of the title character in the 2002 Broadway production of Thoroughly Modern Millie, she has proven herself to be one of the most versatile leading ladies to grace the Great White Way. Her brassy, yet lithe voice soared over the melodies of Cole Porter classics; her feet glided precisely across choreographer Michelle Elkin’s tap number (yes, a tap number at a New York Pops concert! ); and her storytelling chops shone during heartrending takes on a couple of choice Sondheim ballads. She is a true triple threat in a way that most, if not all, of her Broadway diva contemporaries simply are not. At one point just before the evening’s conclusion, Ms. Foster re-emerged onstage with a music stand and binder, announcing that she would be going off-program for a moment. She told the audience that this week marks her 40th birthday, and in light of that fact, she thinks she should start preparing for “older roles.” What followed was rousing rendition of “Rose’s Turn,” the famous 11 o’clock number from Gypsy. As she sang her heart out, I couldn’t help but imagine how she might fare as a subtler, more restrained, more calculating Mama Rose in the hypothetical 2030-something revival. Mark my words: it will happen and she will be terrific. No less talented are her dear friends and fellow performers Joshua Henry and Megan McGinnis. Henry, who starred opposite Foster in the Roundabout Theater Company’s 2014 production of Violet, showcased his smooth baritone on Sam Cooke’s 1964 hit “A Change Is Gonna Come” as well as “Let It Sing” from the aforementioned Violet. In her Carnegie Hall debut, McGinnis performed a delightfully sensitive interpretation of “Neverland” from Peter Pan as well as a duet version of Craig Carnelia’s “Flight.” Arranged by Foster’s longtime music director and collaborator Michael Rafter, the ethereal song proved to be one of the most chilling moments of the evening. Credit is likewise due to the charismatic Pops leader Reineke and his exceptional team of musicians. The orchestra formed a solid foundation for the singers’ voices and also gave a strong showing during their solely instrumental selections. Despite the fact that their medley of the best TV theme songs in history missed a few necessary additions (where was the Gilligan’s Island love ballad? ), Fred Barton’s arrangement was perhaps the night’s most successful. And, of course, Reineke deserves credit for his sometimes stoic, sometimes silly, always impassioned movements at the podium. The evening concluded with Carnegie Hall serenading Ms. Foster with an impromptu rendition of “Happy Birthday,” a fitting ovation to a true star performer and gracious concert host. Thank you, Sutton Foster; we were honored that you’d have us at your party. Thoughtful programming, an uneven performance, but artistic integrity intact with some splendid moments. An exuberant, full-throttle Christmas fanfare with two major mid-twentieth century works.